A secured credit card requires you to put money down before you can use it, so why would anyone choose a secured credit card over a traditional credit card? Usually, it's their only option. Because secured credit cards are easier to get approved for, they are an opportunity for many people who have bad credit, or no credit. Essentially, they could be considered a "bad credit card card"! Secured credit cards can help serve many purposes, here are five reasons to consider them. If you've had to declare bankruptcy in the last six years, you know very well what the implications of that are on your credit report. It's going to be hard for you to get any sort of credit extended to you during the six years the bankruptcy is on your credit report. As such, it's difficult to start rebuilding your credit until the bankruptcy is gone. Unless, of course, you grab yourself a secured credit card. More people are accepted for secured credit cards than regular cards, making it the perfect option for those recovering from bankruptcy to build up their credit again. Building your credit is always a good idea, especially if you're looking to borrow. A great credit score will save you a ton of interest, and a secured credit card is a great tool to help you rebuild! Whatever the reason, using a secured credit card to boost your score is a perfect solution. Believe it or not, this isn't just a problem that young people experience, there are all sorts of people who don't have a credit history. As people get educated about how credit works, they realize they need credit to participate in many aspects of life. There is a need to start developing their credit history, and a secured credit card for this purpose is effective. If you've struggled with debt in your past, you likely have a less than great credit score. This severely limits the credit you are eligible for, making rebuilding your credit very difficult. Secured credit cards come with a reduced risk to the lender, so people who don't have good credit are eligible to be cardholders. It may be your only option in this situation, but it's a great option that actually works in restoring your credit. Being declined to borrow money can be discouraging, we get it. That's why we recommend getting back on track as soon as possible. A secured credit card is easier to be approved for, plus they report to the credit bureau just like a traditional credit card does! Interested in getting yourself a secured credit card for any of these reasons? Refresh Financial offers a secured credit card to help you get your credit score back on track. The best part? Everyone is approved! Grab yours now! 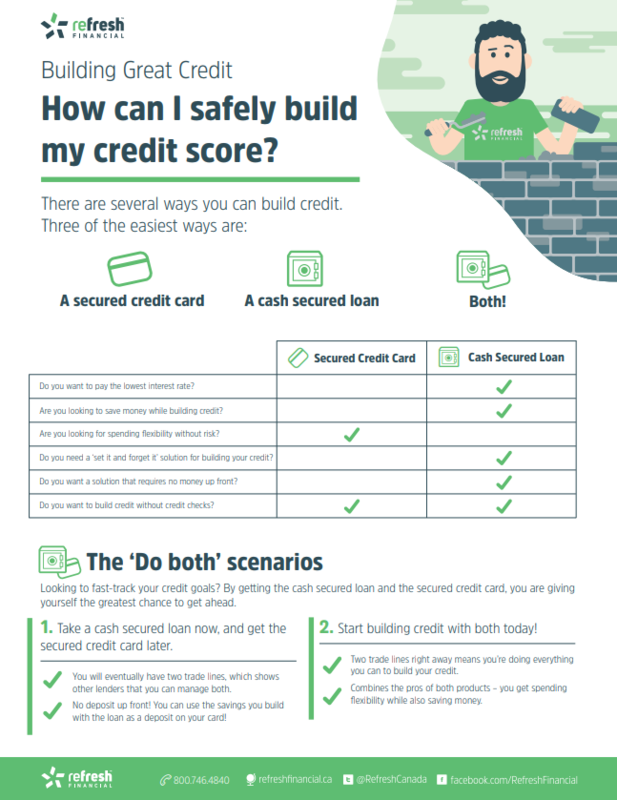 Not sure if a secured credit card or cash secured loan is best for you? Check out our handy graphic to help you decide!